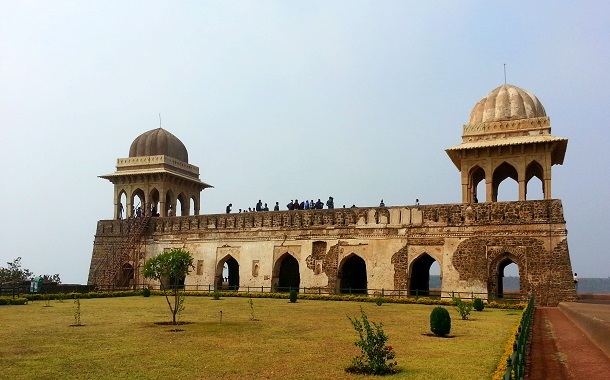 There was a time when Mandu or Mandavgarh came alive with the tales of romance of Baz Bahadur and Rani Roopmati. The classic case of love at first sight can be visualised in the hidden corners of these grand palaces. Even though this little town in the Dhar district of Madhya Pradesh lies in ruins now, its walls still evoke the tales of the past. Nestled atop green fields, Mandu which overflows with beautiful Afghan architecture is just an air ticket away. Its beauty lies in its ruinous state even though it must have been a magnificent monument once upon a time. Open from morning to evening, there is no entry fee for this monument. It belongs to two different periods of construction. 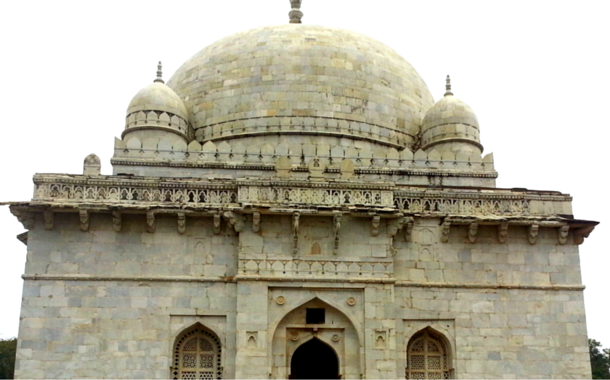 The earlier one represents the madrasa, while the later served as mausoleum. Asharfi Mahal is usually a quiet spot and you can easily read a book or have chai here. Said to be an inspiration for the Taj Mahal, it is built of white marble in its entirety. It is also said that this was the first marble structure of India. The elegant structure embraces Afghan art and architecture along with intricate lattice work and a well constructed dome. Hoshang Shah, being a dominant figure and a daredevil of his time, definitely ensured that he was laid down in style. As the name suggests, the palace standing between two tanks, looks like an anchored ship between the Kapur Talab in the eastern side and Munja Talab on the western side. Mandu being a monsoon town, the view is enhanced when the rains fill the tanks. 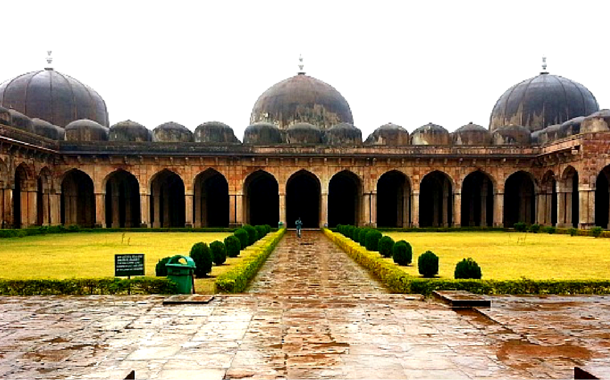 It is said that Sultan Ghiyas-ud-din Khilji, who ruled Mandu for 31 years, build Jahaz Mahal as a harem to accommodate around 15000 women. Whatever, the purpose maybe, the imagination and creativity put into building it definitely makes it worth the visit. Legend has it that this monument was inspired by the great mosque of Damascus, Jami Masjid was built by Hoshang Shah and completed by Mahmud Khilji I in 1454 A.D. Despite the nominal entry fee, the masjid is extremely well maintained with it mowed lawns and the intact majestic structure. Even though you can explore the monument on your own, it is always better to get a guide who can explain the structures better and regale you with tales of the past. 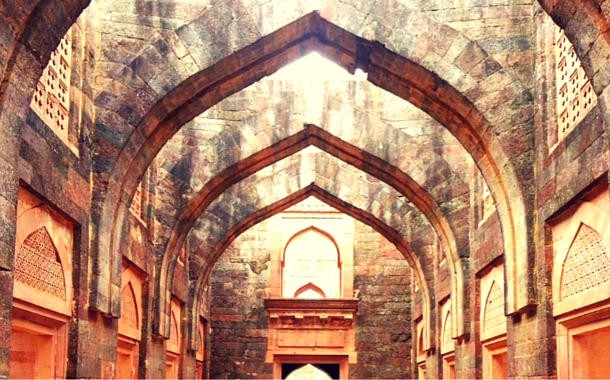 No trip to Mandu is complete unless you visit the palace of Baz Bahadur. Baz Bahadur, the paramour of Rani Roopmati, was a lover of music and arts. His palace, a confluence of Rajput and Mughal architecture, lies atop the slope of a hill with beautiful natural scenery surrounding it. The spacious courtyards and high terraces amidst the green trees washed by the rain helps one imagine how Baz Bahadur must have longed for his beloved. The mystique of the palace makes you realize why Baz Bahadur paid more attention to his paramour and music than his army. Hindola Mahal gets its name from the architecture of the place due to the highly inclined walls giving the illusion of a swing. This T-shaped building used to serve as an audience hall or a Diwan-i-Khas during the time of the Malwa Sultans. It may not be as elaborate in architecture as compared to some of the other monuments of Mandu, but it is still aesthetically appealing. In the same complex as the the Jahaz and Hindola Mahal are the Hamams or Turkish baths, which at that time had provisions for hot and cold water. Ask a guide to explain the features and it’s a guarantee that you’ll be amazed at how scientific their mechanism was. At a distance, you can see a well which leads to an underground escape tunnel. Despite having no internet and television, they certainly led an interesting life, maybe even more interesting than ours. Rani Roopmati, a songstress, enamoured Baz Bahadur with her beautiful voice. The pavilion, located on a steep hill beyond the Baz Bahadur Palace, is the highest point of Mandu Fort. On the condition that she should be able to view the Narmada and the palace of her beloved, this pavilion was especially built for Roopmati. The love story might have had a tragic ending but the magnificent pavilion has set their love in stone. At its prime, Mandu must have been an important place as is witnessed by the marvellous architecture. Famous for being a monsoon town, the rains definitely enhance the look of it. Bike rides with your beloved or road trips with your family, this town caters to all. 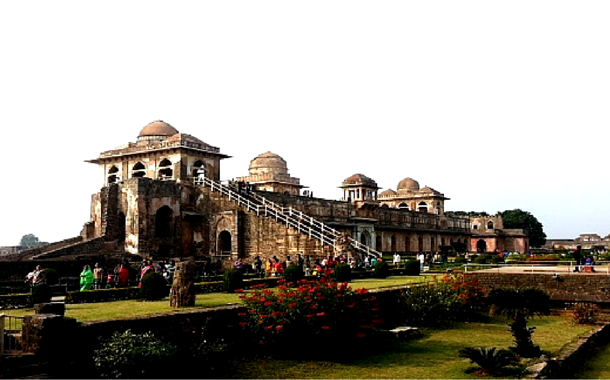 Step into the borders and enjoy your trip to the sepia toned Mandu.